Post sponsored by Whitehat SEO Tool The Only Automatic Tool to get better Backlinks and not get Penalized by Google. The boat, which brought passengers from Genoa and had to go to Tanger, rammed a crane that caused a fire when it fell. The strong wind seems to be the cause that this morning caused a large ferry from the company Grandi Navi Veloci (NGV) to hit a crane at the port of Barcelona that in its fall has caused a fire that has affected fifty containers, sinister that in turn has activated the Chemical Safety Plan of Catalonia in the alert phase. The accident, despite its ostentation, has not caused injuries. Only two workers have had to be treated for anxiety attacks. The maritime captain of the Port of Barcelona, Javier Valencia, and the general director of the Port, José Alberto Carbonell, have agreed that the wind could have influenced the event. They have said at a press conference about the incident, although they have said that we must wait for the result of an investigation by the Maritime Accident Commission of the Ministry of Public Works to confirm the causes. The accident occurred at 8 am when the ship Excellent NGV and ntraba in the port from Genoa (Italy) to pick up passengers and vehicles and continue the trip to Tangiers (Morocco). As he approached his terminal, the captain, who was accompanied by a pilot (a maritime professional from the port who attends to the patron of the large ships in the maneuvers of entry and exit), has requested the help of tugboats since the wind it made the maneuver difficult. The complexity of the maneuver is that this type of large ferries (the Excellent measures 200 meters long, like two blocks from the Eixample) must turn around in the middle of the port to be able to moor from the stern and be able to disembark on the part of back the vehicles. The collision with the crane occurred from the bow and starboard side (front right) when the boat had already taken almost the entire turn. “When the ship was ready to leave again to wait for the tugboats has moved and hit a crane from the APM container terminal,” explained Carbonell. The crane has fallen on some containers, five of which harboured inflammable and corrosive substances, which has given rise to a fire. The firemen of Barcelona have controlled the fire of the crane and the containers around 11 in the morning and have extinguished it at the beginning of the afternoon. The event has forced Protecció Civil to activate the Chemical Safety Plan of Catalonia (Plaseqcat). The Servei d’Emergencies Médiques has sent six ambulances that have treated two people for anxiety attacks. In fact, when the crash and the fall of the crane occurred, several workers who were at the dock fled in terror. The Excellent, which has a capacity for 2,230 passengers and has a games room, two restaurants and a bar, as well as a shop, covers journeys between Barcelona, Italy and Morocco. At the time of the event, he had just arrived from Genoa. After arriving in Barcelona, where I took more tickets and vehicles, I went to the port of Tangier. The ship, which had about 400 passengers, has been moored at the Costa dock waiting for an assessment of the damage. In addition to the impact of the bow with the crane, it also has damage to the bulb of the bow, that is to say, the projection of the lower front part, the most submerged one, which was the one that impacted with the dock. 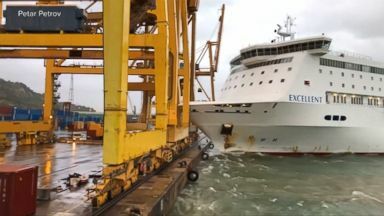 Tonight a new ferry from the same shipping company is expected to arrive in Barcelona to pick up the passengers who were aboard theExcellent, as well as those waiting to board the terminal in Barcelona. Many of them are Moroccan families returning to Tangier from France, Italy and Spain.